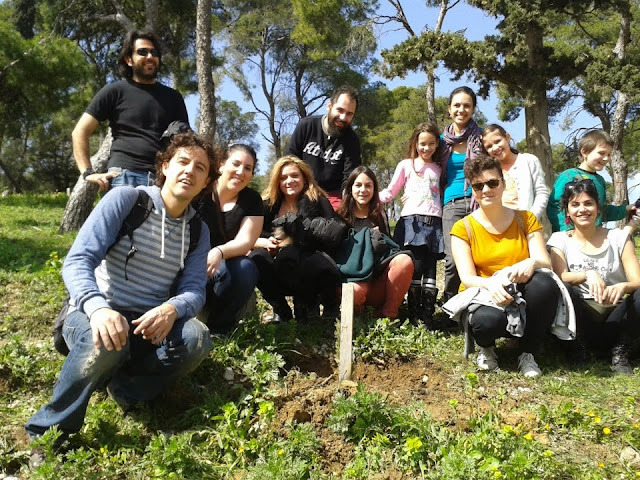 Volunteers in EDRA: Τree planting activity at "Antonis Tritsis" park! Last February, the seminar for ex-EVS volunteers took place in Athens. The seminar coincided with the program "Στο βάθος...ΚΗΠΟΣ!" ΜΚΟ "ΕΔΡΑ", where I'm working. I informed our trainer about the program and he happily accepted the proposal and he with the rest of the volunteers participated in it. So for half a day the seminar moved from the centre of Athens and Omonoia Square to the metropolitan park "Antonis Tritsis", where volunteers helped in a tree planting activity in the forest area of the park. In the activity volunteers from "Φίλοι του Πάρκου" group also took part as well as children from the Greek Red Cross with some volunteers from NGO "EDRA". Once a volunteer, always a volunteer. Meeting other volunteers is always a fantastic experience which always fills you with energy and new ideas. But once you come again face to face with your volunteer self it is impossible not to proceed in a new voluntary action. So, when Stella informed the participants of the EVS annual event reunion about the “Parko Tritsi Project” it was sure that we would participate. And it was awesome! We, kids and other volunteers of EDRA managed in no time to plant many trees, take care of others and learn things about gardening that we had never heard before. Such actions, beyond their social impact, fill you with energy and positive feelings. Keep going EDRA! With only just a few days back to Greece, having fresh in my mind my 8-month EVS experience in Spain and trying to get used to the old reality, I got together with other ex EVS volunteers in Athens for the Ex EVS Annual Event. All the team members appreciated and responded to the great idea that Stella had for our group to join the tree planting activity to the Environmental Awareness Park “Antonis Tritsis”. So we transferred the seminar activities from the typical hotel conference room to this amazing urban -unlike others- park. We enjoyed the wonderful Sunday morning, got to know new and cool things about trees and plants, took positive action for the environment and made new and interesting friends with the other volunteers. “The garden in the background” surely did fill me with positive energy! I’m being a volunteer for many years! There are many reasons to be a volunteer; I don’t remember why I started but I’m happy that I did it! 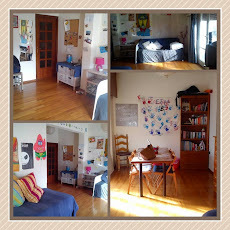 There are a lot of projects: for one day or more, for some hours or even months! You can start from something that doesn't take a lot of time, so I thought EDRA was the perfect place to start as it has many projects!!! I took part in a small project for few hours in the park "Antonis Tritsis". The project was about planting trees and takes care of others. If you are a volunteer you can surely learn many things! Thank you EDRA for that experience as I learned a lot about trees and I’m happy that I helped and participated in this activity. We had our annual meeting in Athens. 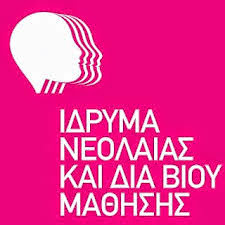 We are Greek volunteers who worked voluntarily in different European countries (European Voluntary Service). In this meeting we discussed about our experiences abroad and the opportunities that non typical learning gave us. The meeting became much more creative and interesting, when we visited Stella (former EVS volunteer) in the environmental park 'Antonis Tritsis', where she was working. Stella was working there as an agricultural scientist until this day.Visiting the park was part of our training. Stella is working with little children, in order to create a vegetable garden and to make a plantation (pine trees e.t.c.). So did we!! We all gathered there in a great sunny Sunday! We met the children and some other volunteers, who were taking care of the park and participated in this wonderful activity. With some guidance by Stella, we started using the planting tools and we digged our first hole in the ground! We then planted our roots and covered them with soil. It was so much fun! We were sweating, but it was worth it! Thanks to Stella's suggestion of visiting the park, we got to know some basic ways of planting trees, we met other people and we enjoyed the company of the children involved. This was a great experience and I wish we could repeat it soon. This activity promoted the importance of human cooperation, the need for environmental awareness and the ideals of volunteering.